Built to last, these log swivel stools are inclined for extra comfort and feature 3" diameter legs and solid wood tops. Our swivel stools are available in 24", 26", or 30" heights. Shown is skip peel finish with Cactus fabric. 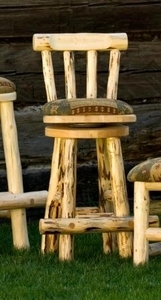 Made 100% by our craftspeople in Montana from standing bug killed salvaged wood, the most environmentally sustainable furniture product possible. The Frontier line comes in our standard skip peel finish and for a little more you can get our clean peel or rustic bark finish. See our log furniture finishes. Custom staining is also an option, please inquire for specifics. All stools can be custom made to fit your height requirements. See our rustic fabrics.